A healthy diet is important at any age, but your needs will change with age. Seniors have different dietary requirements, and it’s important that the retirement communities serving them understand those differences. For example, seniors have an increased need for Vitamin D and calcium, essential to better bone health. Seniors are at greater risk for broken bones and falls, but increased intake of fortified cereals, dark green leafy vegetables, and fish can help improve bone health and reduce the risks associated with a fall. Increased Vitamin B12 is another important factor in a senior diet. B12 helps keeps the body’s nerve and blood cells healthy and can help prevent anemia. It’s found in lean meat, fish, and fortified cereals. Meals for seniors need to drastically reduce sodium as well. Sodium or salt is linked to high blood pressure and risks of heart disease, stroke, and congestive heart failure. Meals at All Seniors Care Living Centres are heart-friendly and promote better health. Potassium found in fruits, vegetables, and beans can help reduce high pressure as well. Another change common in seniors is decreased caloric intake. You need fewer calories to maintain a healthy weight. Decreased energy or joint pain can reduce your mobility and mean you burn fewer calories, which should be reflected in your diet. Each of our retirement residences offers different dining options designed to meet your needs. While some provide two meals a day, others provide all three. Residences like Chapel Hill in Ottawa provide full dining service and private dining rooms when you have family and friends visit. Meals are dietician-approved and there are options to fit a wide range of medical needs, including diabetic choices, and with menu options to satisfy your tastes. The culinary teams at All Seniors Care Living Centres are all led by Red Seal certified chefs. What difference does the Red Seal make? The Red Seal is short for Red Seal Interprovincial Program, a certification that allows skilled chefs to practice their trade across provincial borders, and in the United States, without have to take any further examinations. The Red Seal is administered jointly by federal and provincial governments for dozens of trades, including chefs. It’s an endorsement of the skills and experience the chef has earned after completing 5,000 hours of work experience as an apprentice and 18 weeks of technical training. The Red Seal is a pinnacle of achievement in the dining industry. Find out more about Red Seal chefs at a seniors home residence in your province by visiting or giving us a call. It’s incredible the difference a world-class team of chefs can make. 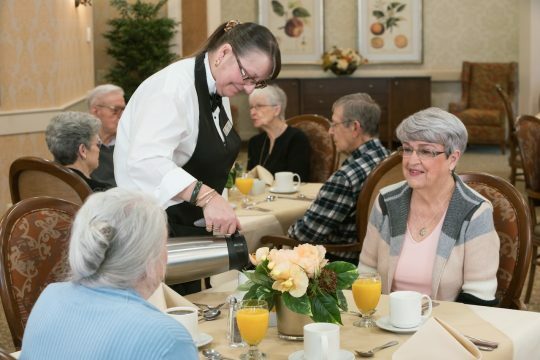 The dining experience is crucial in your retirement residence. Don’t hesitate to ask about menu options at our various residences and how we can meet your dietary and nutritional needs. We believe in redefining senior living across Canada, and the dinner table is a great place to start. Our retirement residences serve up tasty, healthy meals every day. As a family-owned and operated company, All Seniors Care aims to deliver a superior retirement residence experience. That includes providing healthy and delicious meals customized to meet seniors’ dietary needs.